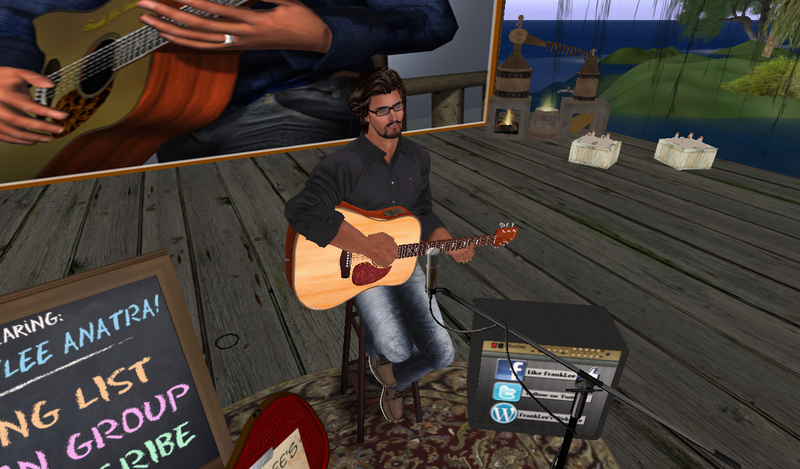 He streams from Niagara Falls, Canada and he's been thrilling live Second Life music audiences since 2006 with his clear-as-a-bell vocals and exceptional guitar work. He also has one of the most progressive song lists in the business. Let's meet and greet Max Kleene and get the story of his amazing success in SL music. She’s gorgeous; she’s intelligent; she has a great personality; and she’s not afraid to roll up her virtual sleeves to get the job done. She is arguably the most influential and powerful woman in the highly-competitive and notoriously-tough Second Life live music industry. 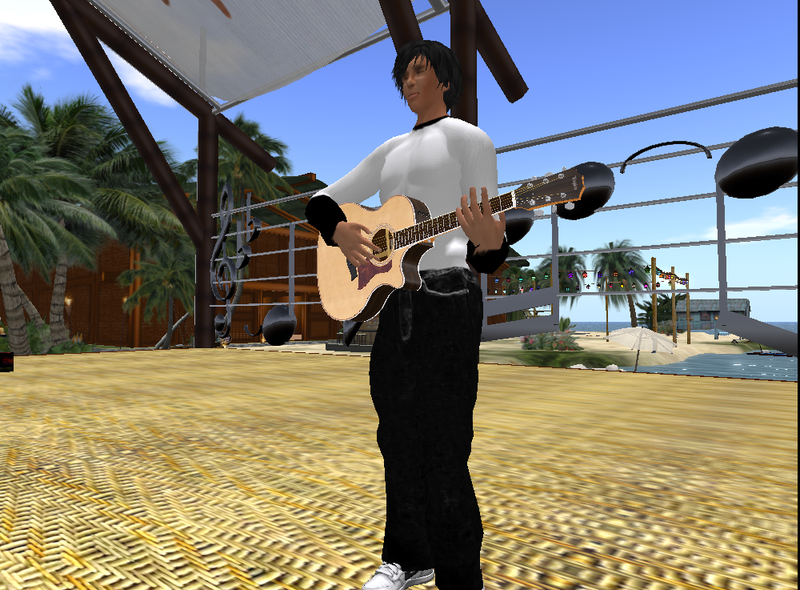 Sher Salmson and I go back a long way in Second Life music. I can remember - clear as a bell - the day she took over the reigns as manager for AcousticEnergy Nitely. In fact, in one of the several articles I published about AE I reminisced that back in those days, Sher did everything possible to promote her client short of selling his recordings from the trunk of her car. 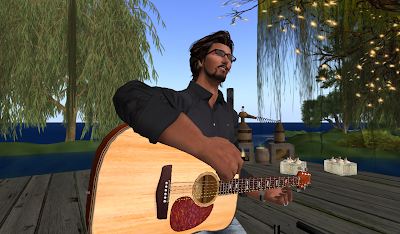 Now he’s a bona fide SL music star, and her SpiritFire Entertainment group has become the gold standard for effective, ethical music management inworld. I recently shared an extended “off record” chat with Sher, something we seem to do every few months. Without violating our confidentiality, I can tell you that one general topic kept coming up over and over in our discussion: standards. SpiritFire Entertainment has become a market leader by adhering to a high level of professional standards, and by requiring that every artist on her growing roster live up to those same standards. On her agency website, Salmson comments: “We take great pride in being reliable, dependable, knowledgeable, professional, courteous and responsive to the needs of our artists and clients.” To me, this says it all. Without those qualities we invite a free-for-all atmosphere - an environment that is not good for anyone involved. I spoke with Sher about SpiritFire and her astounding path to success. Traci Nubalo: Sher, I know that you and your team operate your SL business on a principle of higher standards. Can you tell us about that? Sher Salmson: Our "team" - SpiritFire Entertainment - has systematically and methodically worked towards setting standards and holding to them. It is a process, and it is based on what most would call an "old-fashioned" theory: hard work, long hours, and mutual respect. TN: How do you account for this astounding level of professional growth? SS: Traci, I am a professional in RL and I saw no reason for that not to carry over to SL. I think anything worth doing should be done with one's whole heart and my heart is melded with music and with the beautiful artists who so freely share their souls with us. Anything I am passionate about gets my 100%. Also, I have been a venue owner, a musician, and now a manager so now I have a perspective of sorts from different angles. Sher (who had an online Christian ministry before the music career) has used this diverse background to grow SpiritFire into one of the top agencies in SL. From those early days with AE as her only client Sher has built the company into a virtual juggernaut, providing the very best managerial services to a catalog of a “who’s who?” of some of the best performers in SL including AE (of course), Alex Mays, Allister Westland, David Csiszer, Edward Kyomoon, Harper Messmer, Louis Volare, and Quantamis Navarathna. Her artists speak very highly of her, and so do the many venue owners that SpiritFire provides with performers. 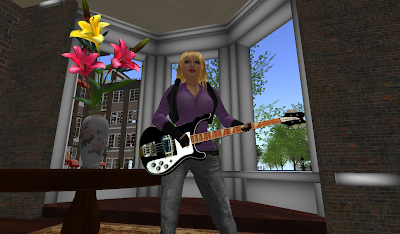 One of the cool new projects she is developing is called SpiritFire Music Isle, a base of operations sim shaped like a guitar. Each artist on her great roster will have his/her own listening station in a beautiful, quiet setting. There’s also a main stage where her established artists can play as feature act, and newer acts can hone their craft. “It’s all about MUSIC”, she informs me. “It’ll be a musical home for our established artists and a place where we can assist artists who are new to the SL music community.” She went on to discuss the team aspect of her organization. SS: There are seven of us who work behind the scenes and each one is committed to the standards we discussed. I will tell you that it makes me so proud of the team. I notice that consistently - without fail - when it's showtime they launch into action. TN: So what's next for you Sher? You are at the top of your game. Where do you go from here? SS: Traci, the short answer is "moving forward." I'm never satisfied with the "status quo". Several of our artists have new CD's coming out and this excites me to no end. One thing I really love is to witness and enjoy an artist as they spread their wings and take their music to a whole new level of creativity. TN: It can be a thing of beauty. SS: Yes, and it makes me smile just to think about it. I tell people that I have the best job in SL. 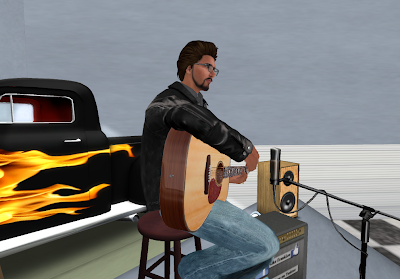 I get to listen to some of the best music in SL on a daily basis! In a virtual industry where some artists don’t even bother to tune their instrument before playing, observing any one of the acts that Sher manages can be like a breath of fresh air. The artists are trained to do the things that will represent themselves and their agency professionally. They arrive on time; they seem to always have kind words for the musician who is leaving the stage to make room for them. They also learn that they - the artist - also represent that venue, so you will frequently hear them asking their fans to please support the house by being generous to it. I’ve been told by club owners that when they book an act from SpiritFire they can relax, knowing that the show will go well for all concerned. Sher Salmson has worked long and hard to land in such an advantageous position in the SL live music industry. And the same standards of professionalism that got her and her team to the top will keep them there. It’s great to see the good guys winning the race! She's been thrilling Second Life audiences for years; she has a killer singing voice and excellent guitar chops. She's written and recorded an amazing catalog of stellar original songs and has recently tweaked her live sound, making her performances better than ever. 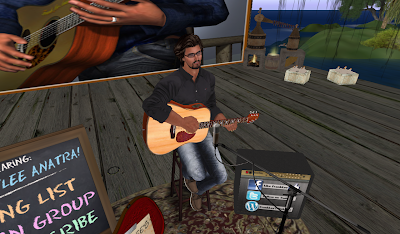 Join us as we go backstage to talk with the great NANCE Brody, one of SL's most-loved live performers. I arrived early at the studio. My friend and co-worker Netera Landar has a talk show - “The Netera Landar Chat” - on Metaverse TV and she had loaned me her living room set for this interview. I was anticipating finally meeting FrankLee Anatra, who I had admired musically for some time now. When he tp-ed in our time together began with us sharing an unexpected laugh. It turns out that Netera’s set utilizes furniture designed and made by Franklee and his SL partner Winter Thorn. Chuckling, he took a seat on one of the sofas and demonstrated the guitar-player anims they had built into the units. Too funny! When I first heard Anatra perform I was immediately attracted to that voice of his. It’s clear as a bell with great intonation and quite a few different possible tonal colorations. And when it’s needed, he artfully adds a gruff little vocal edge underneath. This is by far not the singing of a noob; his is a pro voice all the way. The quality, the timbre and the overall execution brand him as a seasoned, veteran performer. As I watched Franklee ply his trade in his debut performance at the exciting new 50’s Rock and Roll sim I made a note to ask him about his musical background. But first he had to finish nailing yet another Second Life audience to the wall. He powered into “Hey Soul Sister” from Train, not only doing the song justice but simultaneously claiming it as his own style-wise. And in a surprisingly-successful move, he shifted gears again. “Let’s do some Beatles by way of Joe Cocker,” he quipped as he slipped into the opening strains of the well-known-and-loved “She Came In Through The Bathroom Window” - much to the delight of an audience that he had captured five minutes into his set. I’ve since learned from hanging out at Franklee’s gigs that such a wide chronological and sylistic difference is not only commonplace for him, but expected. He employs one of the largest song lists I’ve ever seen: more than 225 great covers spanning several decades. He took up the guitar as a bored 18-year-old army recruit stationed overseas. Upon returning home to Southern California he joined a doo-wop group called Slick City, the members of which would be his off-and-on bandmates until this day. They were heavy on covers and tight harmony vocals. “I played rhythm guitar. All four of us sang lead and harmonies depending on who brought the song. I can't stress enough how much I love harmonizing”, Anatra passionately reveals. Apparently he loves it so much that he’s introduced the DigiTech Vocalist Live 3 Harmonizer into his tech setup. This enhances his lead vocals, which sit in the mix beside the clean, clear tones he’s getting from the Martin OMC-1E acoustic 6-string guitar that he loves so much. He uses a 1986-vintage AKG C535EB microphone for the vocals. 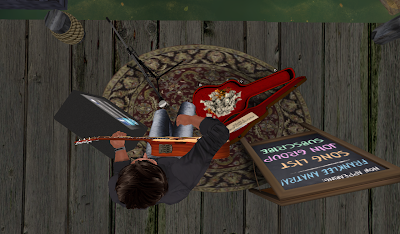 He runs both guitar and vocals through the harmonizer to a 6-channel USB board and then to his laptop for streaming into SL. Franklee has “turned the key” on the function of the harmonizer, in my opinion. He understands the equipment as well as he understands the music - another pro quality. He’s figured out that the most natural-sounding use of this item for today’s singer/songwriter is to drop it on the lead vocals with the lightest of touch. This prevents the resulting harmonies from suffering with that dreadfully-robotic sound that is heard far too often in contemporary pop music. Back at 50’s Rock and Roll the joint is jumping and Franklee treats the crowd to a gorgeous, harmony-heavy ballad “My Valentine”, from Paul McCartney’s most recent album Kisses on the Bottom. Whereas Sir Paul relies on Clapton’s superlative guitar work for color, Anatra puts the vocal harmonizer back in play, creating a gorgeous bouquet of stacked vocals. Then he gets the crowd up and dancing again when he launches into an original tune he calls “Me I Kinda Like It”, in which he salutes his doo-wop roots with a guitar-and-vocal piece that’s contemporary in its own right. He had the Live 3 warmed up at this point, and used it very artfully in a lovely reading of “Because”, from the Dave Clark Five. I give this guy the highest marks on several levels: his is a wonderfully-sweet singing voice and he accentuates it with a clear, expressive guitar style. Add in that killer, multi-decade song list and some excellent originals, and he’s ready to take any SL venue by storm. 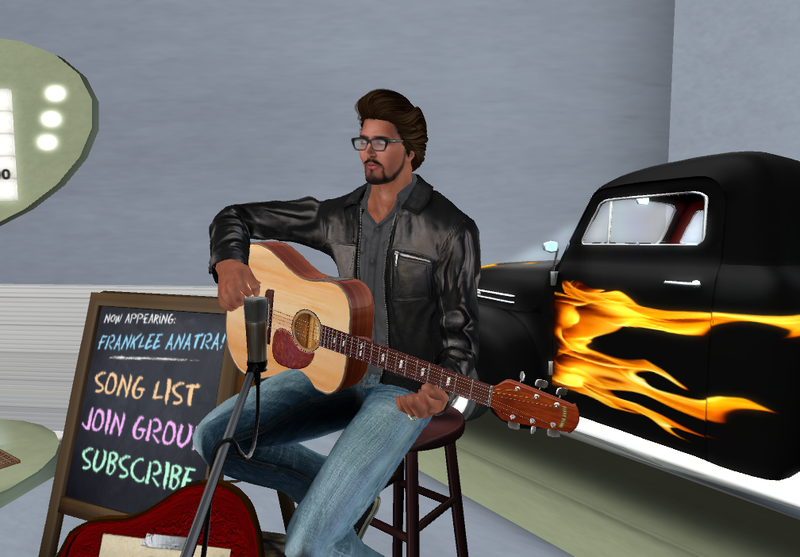 I can’t suggest strongly enough that if you are that rare SL music fan who has not seen Anatra perform live, head on out to his very next show. He’s filling top Second Life music rooms night after night, with his loyal and active fan group The Dreamers in tow. I asked Franklee to give them a shout out. We - FrankLee Anatra’s fans - are the lucky ones. AUTHOR'S NOTE: The above article was originally written to appear in VMS Magazine. Unfortunately, when the piece appeared in print their alleged "editor" had taken it upon herself to delete some paragraphs, and cut/paste what was left into a final form that is only barely readable, and not even close to the professional standards which I try to bring to my work. This blog version of the FrankLee piece is the ONLY CORRECT version. My question to VMS is this: As a well-respected, award-winning journalist I'm wondering where the line is drawn. If I was an oil painter or sculptor, would you have "added paint" or "cut a few new gouges" into my work after the fact? And then, would you have hidden behind the word "editing" to justify your actions? Recently I’ve started using the music-sharing service Spotify as part of my home entertainment arsenal. I’ve been having a grand time passing quite a few relaxing hours plugging my favorite bands’ names in and being rewarded with much or all of their available catalog - now on my pc. One of the names I entered was Max Lasser - a blast from the past for me. For those of you whose knowledge of Lasser is lesser, I’m going to fill you in. Max is a master-level guitarist from Zurich, Switzerland. He’s an uber-slide player, and one of the most inventive, precise, and original guitarists to ever touch the strings. I first met Max Lasser at a major recording studio on the East Coast USA, back in the day. I was at the studio doing some business for a client when Max was brought in, presumably to do the same. He had recently completed a long stretch of recording and touring with the amazing Andreas Vollenweider & Friends, the Grammy-winning New Agers. Max’s guitar work had contributed immensely to the Swiss harpist’s gold record for “Down To The Moon” and to a legendary first North American tour by the group. 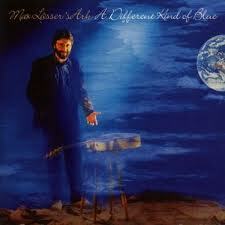 Lasser’s own debut album “Max Lasser’s Ark: Earthwalk” had been released on CBS Masterworks and was moving steadily up the charts. Max’s stock as a gunslinger was riding pretty high worldwide. We were all introduced around and I happened to blurt out that maybe Max would like to meet Nils. I knew that the mighty Nils Lofgren of E Street fame (on hiatus from his day gig playing guitar for Bruce Springsteen) was recording in one of the larger studios on site. Max’s eyes got as big as Zildian cymbals at my mention of this name. “Nils? Nils Lofgren? He‘s here?” So we walked Max down the hall and I popped my head into Nils’ booth. He was sitting on a road case reading a paperback while his engineer engineered something. He looked up from the page. They embraced with a respect reserved for old friends and great guitarists. Turns out they were actually huge mutual fans. We left to give them some space. That way they could discuss whatever it is that major music figures talk about when they get together. That was my personal introduction to Max Lasser and it was enough to pique my interest in him and his work. I became a huge fan in the process. He would go on to do well with two CBS Masterworks releases, then one for Narada. Recent years have had him continually creating good music, including a stint collaborating and recording with South African trance guitarist Madala Kunene. Finding this treasure trove of the “missing Max” recordings was enough to bring a big old smile to my face. Headphones cranked I let ‘er rip. As fate would have it, my first click was on a track from his 1997 release Between called “Shuffle Dance”. Delightfully playful; almost an acoustic ZZ Top boogie. And check out the clear, sweet sound of real brushes on real skins after the first turnaround. Max’s slide work was, is, and will always be masters class material for anyone interested in clean, precise, nastyass slide. A mega-tasty vibes solo pushes the guitar to the front, flat-picked on the left and slide on the right. In clear homage to Ry Cooder he fast-licks away with the steel, while churning out an irresistible rhythm with the fingers. As if simply being a world-class guitarist is not enough, Lasser is also a great writer and an excellent producer, especially with his own material. In a Max mix, every instrument is well-defined and “visible” along the stereo spread, right down to the crystal-clear guitar harmonics which close "Shuffle Dance." The title track (“Between”) displays the mighty Max tossing away the slide to set the acoustic ablaze with bare hands; sharp, tasty, jazz-inflected straight ahead attack with sparse-but-driving bass and drums and some keyboard voices pushing him onward. The final Lasser side that I want to point you toward is from that same project and it’s called “Jumpy”. From Note One it’s a straightforward, happy toe-tapper with excellent band backing. Again the vibes play counter to his crisp, intelligent slide on the acoustic. Damn this boy can play! “Jumpy” is 4:03 of pure heaven. Go ahead, listen to it once. I dare you! I challenge you! This is New Age/World music so elegantly imagined and created that I can promise that unless you take a listen, you will not comprehend my words. But if you do, I bet that you jump on the Max Lasser fan list at first hearing. I’m glad you asked! You see, I happen to believe that there are true artistic gems lying hidden everywhere around us. Finding them enriches our lives and brings us happiness. Sharing my musical loves with you implies the promise of a great mutual exchange of information, art, and friendship. Good enough? © Copyright 2012 Traci Nubalo. All rights reserved.